With its centered, red maple leaf flanked on either side by red, the Canadian flag is perhaps one of the most recognized national flags in the world. 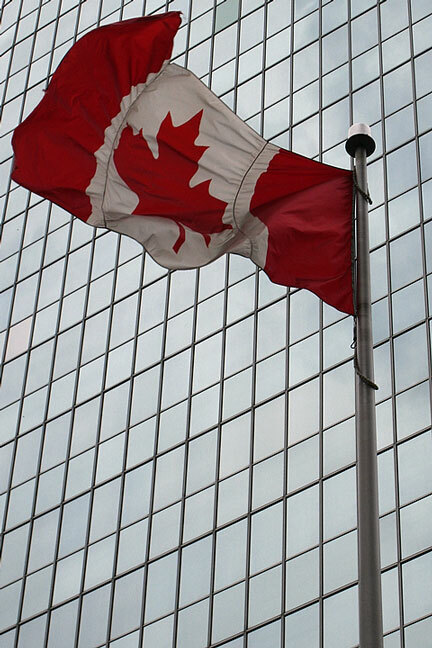 While Canada officially became a nation in 1867, they spent many years without a national flag. Instead, they used the British Red Ensign with the Canadian shield on the fly. 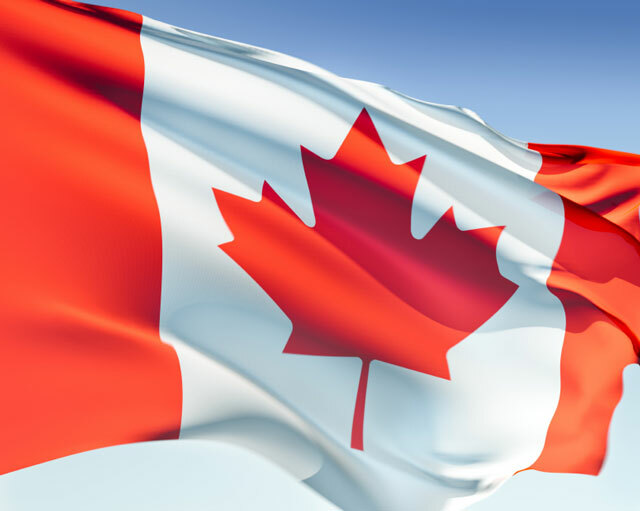 It wasn't until the 1960s, when the public made it known that they wanted their own distinctive flag, that the first Canadian flag was designed. The first flag featured three Canadian maple leafs with blue on either side, to represent the Atlantic and Pacific Oceans. However, this initial flag wasn't accepted by the Canadian people, so another effort was made. In 1965 a new Canadian flag was created, incorporating both the maple leaf and the country's colors. The maple leaf is on a background of white, which represents the snowy north of Canada. The red on either side of the maple leaf represents the sacrifice made during World War I by Canadians. The world's second-largest country, Canada spans across six time zones, from Newfoundland in the East, to the Pacific Ocean in the West. The population of Canada is more than 30 million, the capital is Ottawa, and the currency is the Canadian dollar. Because of its large mass, you can find just about any kind of landscape feature in Canada, from mountains to plains, from lowlands to highlands. Canada is home to many rivers, lakes, and ponds and features extensive coastlines adjoining the Atlantic, Pacific, and Arctic Oceans. The northern-most part of Canada is polar and subpolar, while the south is cool. The interior parts of the country experience longer and colder winters than the coastal areas, and warmer summers. The warmest winters occur near Vancouver in the Pacific Coast. Except for those citizens who live in the Quebec region, who speak French, the majority of Canadian citizens speak English as a first language. Quebec has made a consistent effort to retain its French heritage and culture, and its desire to prevent further Anglicization has caused some strain between the country's two factions. About one million residents in Canada are of native Amerindian descent, while the Inuit population comes in at slightly more than 50,000. A country with massive natural resources, Canada's economy is supported by the export of forest products, fish, furs, and wheat. The export of minerals, including uranium, potash, nickel, asbestos, gypsum, and zinc also contribute to the economy. In addition, Canada furnishes many other countries with energy products like hydroelectricity, gas, and oil. Canada welcomes about 20 million visitors per year, many of them drawn by Canada's untouched landscapes and raw, natural beauty. While Canada is a popular destination for United States citizens looking for short vacations, a fair share of Europeans and Japanese also visit the country. Canada has one of the highest standards of living of any country, including a health service funded from national insurance and an education system in which the majority of high school graduates complete further schooling. Canada Facts - information about Canada and its flag. Canada Government - official Canadian government website. Canada Maps - Canadian maps, geography, and tourism. 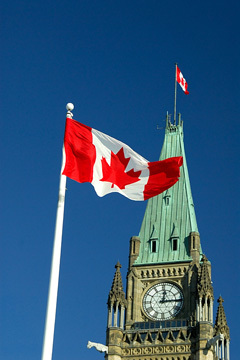 Canada News - news articles and facts about Canada.